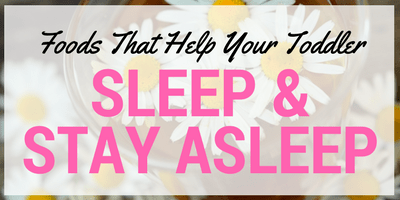 If your looking to encourage your baby or toddler to sleep longer and more restfully (and let’s be honest which parent isn’t?) then one of the main things you need to do is look at their sleep environment! 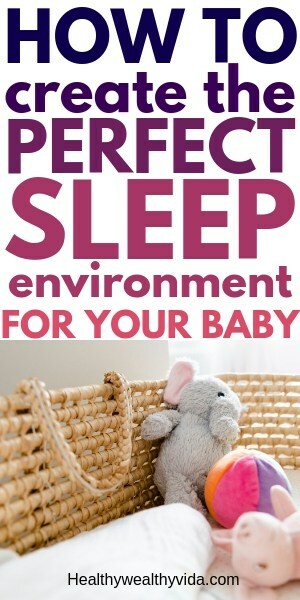 This post will show you 8 areas of the room that affect sleep and how you can create a perfect sleep environment for your baby or toddler. Making sure your child’s room is the right temperature is vital for good sleep. Noone can sleep well if they are too hot or too cold! These baby sleep temperature guidelines will help keep your baby comfortable in summer and winter. Many experts recommend that the ideal temperature for sleeping falls between 68–72°F (20–22.2°C). In the Summer months when it can be desperately hot I personally would opt for the lower temperature in this range or even 1-2 degrees cooler. If you have an AC set it to the desired temperature and let it work on auto. The air conditioner will then kick in when the temperature increases and stop when the temperature reaches the setting you programmed. If you have it set to continuously cool, it will also remove most of the humidity in the room and make the room very dry. By putting the AC on auto, you will still cool the room, without losing all the humidity. note: make sure the crib or bed isn’t directly located in the air flow path of the AC. You will also want to dress your baby appropriately, light cotton pajamas work best, with a very light cotton sheet. The best thing to remember is to dress your baby in what you would wear to sleep comfortably in the heat. If it’s too hot for you to sleep comfortably it will be too hot for your child. For those cold months, keep the temperature within the ideal range 68–72°F (20–22.2°C). Dress your baby in cotton pajamas and a cotton sleep sack like this one. If you have the radiators on, be sure to use a humidifier in the room as radiators tend to dry out the room. Another way to avoid dry air is to place a ceramic bowl in the room. The water in the ceramic bowl will slowly evaporate adding just sufficient humidity so that baby’s airways don’t become too dry. You can also put 2 or 3 drops of Lavender Aromatherapy Oil into the water, as this will benefit your baby to fall asleep easier. Our bodies are designed to wake up when it’s light and sleep when it’s dark. This circadian cycle can be affected by artificial lighting. Too much artificial lighting will inhibit the production of melatonin, the hormone that makes us sleepy and controls our wake-sleep cycles! Not only that but the wrong lighting can also have serious health risks. Avoid fluorescent lighting as it flickers (irrespective of whether you perceive it or not). The flicking has been linked to increased headaches and migraines and in some people even seizures. Fluorescent lights and energy-saving light bulbs also contain mercury (a neurotoxin). These light bulbs emit vapors and ultraviolet radiation that can be dangerous to your health. Opt for LEDs as they produce little to no UV radiation, they contain no mercury and they don’t flicker. In addition, LEDs are even more energy-efficient than other light bulbs so you still have all of the benefits of fluorescent without any of the health dangers. If you must use a nightlight for your child’s room, make sure to choose a red colored led bulb or use a LED nightlight which has a red light feature like this one. Normal colored lights emit blue light which also inhibits melatonin levels, whereas red lights don’t. Babies under the age of 3 to 4 months have not yet developed their circadian rhythm (biological body clock) yet. The circadian rhythm is a 24-hour cycle that determines the periods when the body is awake and when it needs to sleep. When it gets dark, the body releases a hormone called melatonin, which makes us feel sleepy. In the morning, the light at dawn encourages the production of cortisol. Cortisol counteracts the effect of melatonin and the body starts waking up. Bring your baby outside frequently throughout the day, in the morning and in the afternoon sunlight to help their body clock adjust. By getting your baby outdoors in natural lighting their circadian rhythm will adjust faster and it will help them sleep better at night. 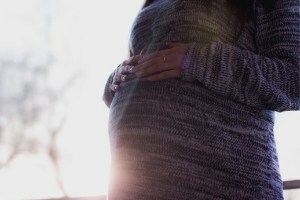 Artificial light interferes with the natural cycle of dawn and dusk, hence the production of melatonin may be prolonged or cut short by artificial lighting, so it’s best to keep lights to an absolute minimum (using a LED red nightlight) or completely off if you want your baby to sleep well. You can prolong the sleep periods with blackout curtains or blinds and gently train your baby to fall into a natural sleeping rhythm during the day. In the womb, babies are accustomed to hearing the constant noise of their mum’s heartbeat, etc. These noises can be as loud as 90 decibels! that’s around the same volume as a lawnmower! 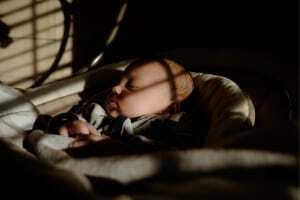 Many babies, therefore, seem to sleep much better with white noise. The benefit of white noise is that it enables your baby to relax before falling asleep by providing a constant, soothing sound as in the mother’s womb. 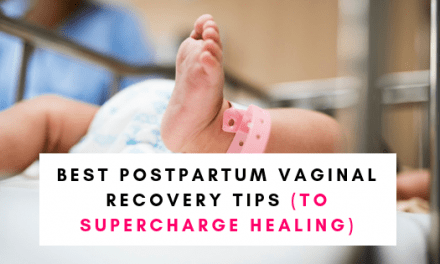 It helps to quiet the mind and cuts out disruptive sounds that can prevent or prolong the time your baby needs to fall asleep. Which noise is more effective, brown, pink or white? While most white noise machines market “white” noise, there are actually a huge arrange other color noises! Brown, pink, or white seem to work well for babies. My child sleeps better with the brown noise as the frequency is lower. Both brown and pink noise are usually found to be more soothing to the ear than white noise. When choosing a white noise machine sure it has different color noises like this one. Fresh air is important for your baby. Always ensure that there is sufficient ventilation and circulation of fresh air in the room. Open the windows for a few hours per day unless you are living in an area with lots of traffic and exhaust fumes as it will help your baby sleep better. If you cannot open the windows, check out some air purifiers like these ones, and consider adding an air purifying plant to your child’s room, out of reach obviously! Smells can have a big impact on our wellbeing and our moods. This also applies to babies and young children. 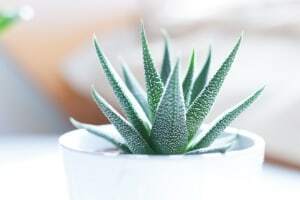 Although science is still not 100% sure how certain smells influence the way we feel or why certain smells evoke certain memories, we do know that certain smells can induce relaxation and sleepiness. 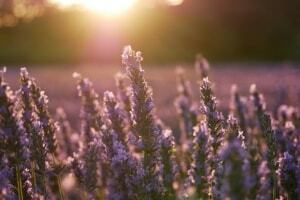 Lavender, Frankincense, Cedarwood, Ylang Ylang, and Roman Chamomile, are a great choice to use in your child’s room. You can use Aromatherapy oils by either putting 1 to 2 drops maximum (no more as too many drops may achieve the opposite effect!) on baby’s bedding so it doesn’t touch your baby’s skin or use a diffuser. Important! Please use only essential organic aromatherapy oils and avoid ready-made mixtures and room sprays as most of these contain ingredients that are toxic. Choose bedding made from natural fibers like cotton, linen or bamboo, and make sure there is no risk of suffocation. The best option is a baby sleeping bag with or without arms. Most baby sleeping bags are available in different tog weights so you can choose a thicker one for the winter and a lighter one for the summer. Start a regular routine! 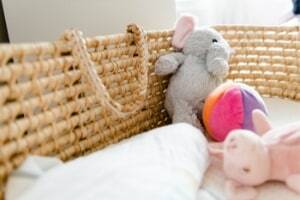 Establish a routine for when your child sleeps, eats and plays and stick to it! 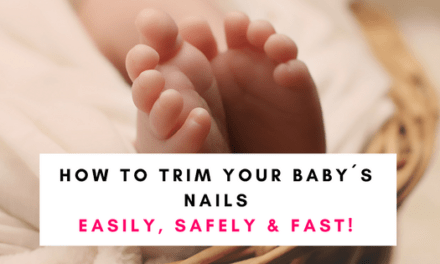 This will help your baby find its natural bio-rhythm. Even though it is not necessary to bathe your baby every day, it does help your baby to relax and fall asleep easier right after a bath and it’s a great way to bond. Start a bedtime ritual that is soothing and relaxing 20 to 30 minutes before you want Baby to sleep. During this ‘wind down time’ avoid loud noise, keep anything that will stimulate your Baby away and dim the light. Stick to the same routine every day so that your Baby gets used to it and knows when the routine starts, it is time to go to sleep. Sticking to the routine will allow your baby to gently calm down but it’s also a great opportunity to bond one on one. Those 8 steps are very simple but effective ways of encouraging healthy and restful sleep in your child, and will hopefully give you more sleep too 😉 If you found this post useful or know of other parents who it would benefit please share!